Not to be confused with Eggland. 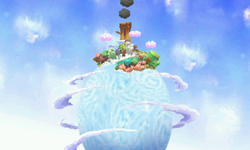 Egg Island is the Yoshis' alternative home which appears in Yoshi's New Island. Egg Island is in front of Yoshi's Island, the other and the main island of the Yoshis. Portuguese (NOE) Ilha Ovoadora "Ilha" means "island" and "Ovoadora" is a pun on "ovo" (egg) and "voadora" (flying). This page was last edited on October 1, 2018, at 01:06.